I grew up in “the best” neighborhood in Cleveland! It was filled with kids, right next to Lake Erie and centered around the church and school. It was predominantly an Irish-Slovenian area where everyone knew everybody. It is worth multiple blog posts, for sure! But today I look back on my cheer leading days. Can you tell which one is me? Check out the green and white saddle shoes! During my junior high years, I was a cheerleader for basketball games and then, later, football. It was a lot of fun! Our coaches were women in the parish community who stepped up to guide us. Mrs. Sanelli was a feisty mom with whom you didn’t mess around but was always fun to be with. Judy was a young mom, possibly divorced or going through a divorce, with a beautiful little boy, around the age 2 or so. She would bring him to practice and we all doted on him as he was just adorable. When we heard the news that he died, we were shocked. He died unexpectedly in his sleep. As you can imagine, it was devastating to his parents. I vividly recall the wake and Judy clinging to us while sitting in a chair as we filed past. It seemed that death was as much a part of life in the old neighborhood. Perhaps it was due to the density of people, but it seemed like Mom and Dad were always bringing us to wakes. My neighborhood friend died at age 17. The old neighborhood is still there filled with many familiar faces. Many have married and moved on and have families of their own. Interestingly, many have migrated to eastern suburbs and we cross paths all the time. It’s not quite the “old neighborhood” but there is almost an intangible tie that binds us and we continue to be connected in unusual ways. Certainly via Facebook, but also through our jobs, schools and neighborhoods. I often wondered what happened to our cheer leading coach. I moved on to my high school and college years and would ask about her. I always had hoped that she would find happiness and perhaps a new family. A month or so ago my sister, who lives out this way now, invited my family for dinner. We took a walk in her quiet neighborhood after dinner and encountered one of her neighbors. She was quick to introduce me to Judy _____ who was from our old neighborhood. I stared – and then blurted out – were you a cheer leading coach? Did you lose your little boy? Looking back I think that was a little forward of me to say, but she gave me a warm hug. The ties that bind. Yes, it was my old cheer leading coach. After 35+ years, we had filled what seemed like a lifetime. She shared with me that she had married and had two children, now grown. A few years back she lost her husband. She is married now and living on the same street as my sister. I love this story… thank you for sharing it with us! (I am a little teary eyed now.) 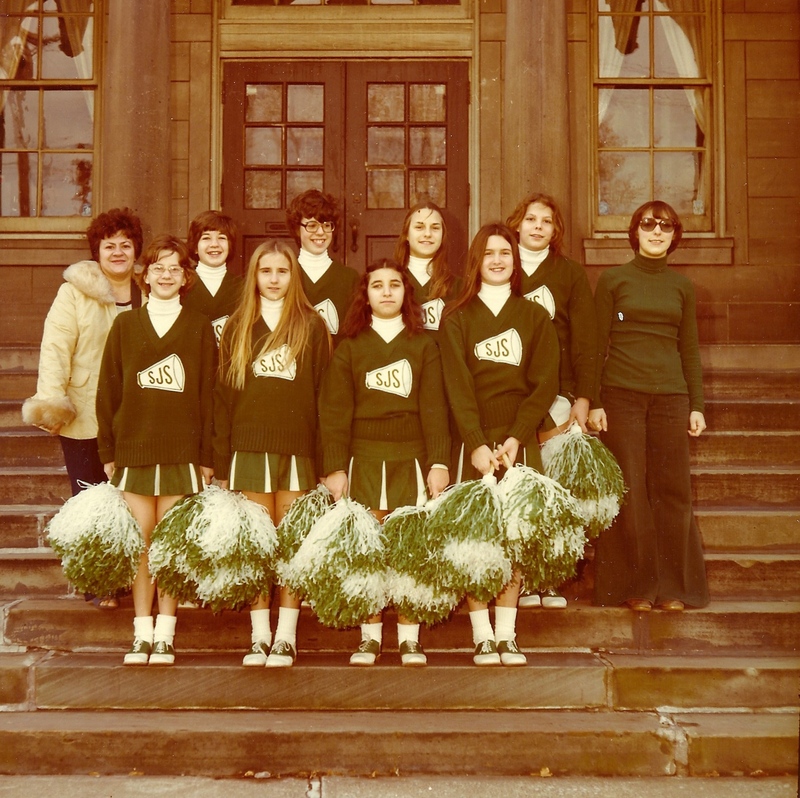 What a great photo of your cheerleading group. Jane – thanks for this! Brought back so many great memories! You are right – our neighborhood was the best growing up! (With of course the best door next door neighbors you could ask for!) I do remember Judy and her son – it is nice hearing an update on her as I think she really had an impact on all of us. By the way – our green saddle shoes ROCKED!